Medieval Monday with my guest Ceci Giltenan & a Giveaway! 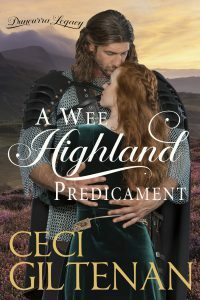 Today I’d like to welcome Ceci Giltenan as my guest for Medieval Monday who is sharing a snippet from her novel A Wee Highland Predicament. Be sure to leave a comment for Ceci for a change to win an eBook at the end of this theme! Happy reading and enjoy! “Aye. Home.” He meant his home, but again, she didn’t need to know that. Follow along next week on Elisabeth Hobbe’s website: https://elisabethhobbes.co.uk/. Remember to leave a comment for a chance to win an e-copy of A Wee Highland Predicament or another e-book of your choice by Ceci Giltenan. Be sure to check out my next snippet from ONLY FOR YOU: The Knights of Berwyck, A Quest Through Time (Book Two) on Ceci’s blog. Leave me a comment there, as well, to be in the running for my giveaway! You can connect here! Thank you so much Annalba. Ceci is a new author to me so her book just went into my TBR pile. Thanks for stopping by and leaving her a comment. Thanks Ann! You’re the best. Ceci is a new author for me. I love the cover image of a Wee Highland Predicament. I will be sure and follow her on Goodread. Thanks for stopping by today, Suzannah! Love the humor in your writing, Ceci! Another delightful snippet. This one is definitely lighter than some of my others but I enjoy funny moments. It sounds wonderful, thanks for sharing.